GRUBER Logistics have recently transported 2 kiln tyres with diameters of 5.56m and heights of 0.99m each weighing 36.45tns. 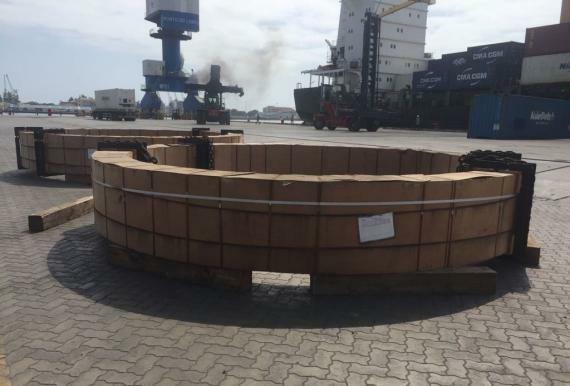 Executive Support Manager at GRUBER, Ramona Duckstein explains; "The kiln tyres were moved from Tianjin to Lobito in Angola and since an L/C was involved which required unloading in Lobito, it was not possible to find a breakbulk vessel as these only called at Luanda. 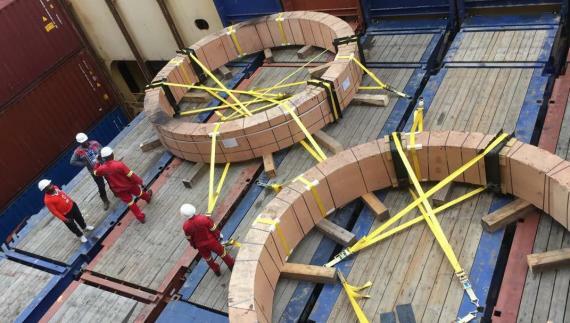 Therefore, we found an option to ship with CMA CGM on 5 x 40' flat-racks on MV. 'CMA CGM Otello'. Despite our clients worries because this involved a transshipment in Pointe Noire in the Republic of the Congo, the cargo was unloaded in Lobito and everything was in good order. The kiln tyres had to be handled very carefully and could only be lashed on 4 specific brackets. 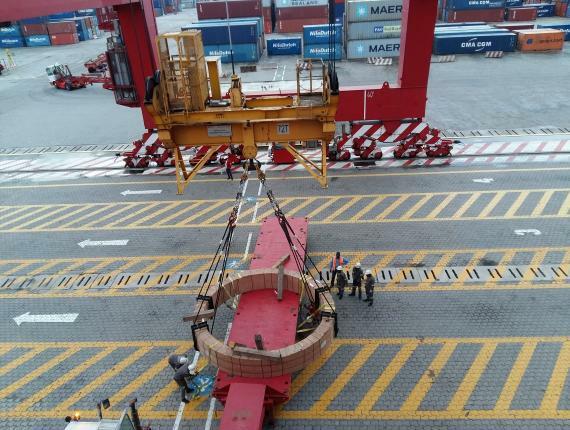 We engaged surveyors in Tianjin, Pointe Noire and Lobito to make sure that the loading and unloading would run smoothly." The kiln tyres are to be delivered to a cement plant in the area of Lobito. See below for photos.